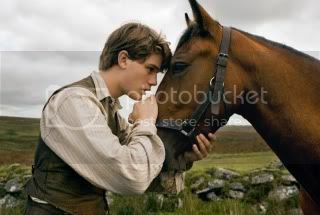 War Horse is an oddity of a film. There’s nothing inherently wrong with the film, at least from a formal filmmaking perspective. It’s exquisitely crafted with a grand level of sweep that puts it right in tow with films like Gone With The Wind or Doctor Zhivago. If anything, War Horse functions as a throwback to a bygone era of filmmaking. Its view of the world seems particularly dated, lacking any hint of cynicism at all. It’s an admirable attempt to view the world in such an optimistic way. 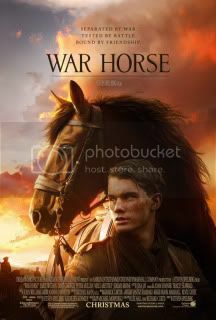 And in a time where films like Hugo and Midnight in Paris look upon a bygone era with nostalgic reverence, War Horse seems to only add to the zeitgeist. But with that in mind, there is a very active attempt to construct a narrative around this shroud of nostalgic reverence, to the point that it feels too manufactured to be taken seriously. 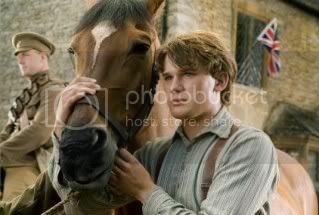 The film’s biggest hurdle, and the one obstacle it never overcomes, is the fact that such an intense emotional investment is based on the relationship between Albert (Jeremy Irvine) and his horse Joey. It becomes especially problematic when the film depends on Joey to unite various vignettes throughout the narrative. The horse, with all the mysticism that surrounds it, ends up becoming a creature of bad fortune, bringing death to various characters that it comes in contact with. It’s something that doesn’t really get discussed outright, with Spielberg diligently imposing a sense of spirituality to the proceedings. 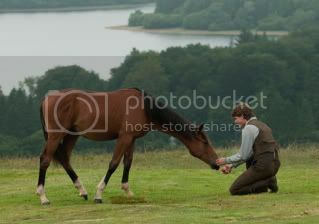 Such spiritual undertones being ascribed to a horse can become comedic, particularly given that Spielberg is maintaining a fairly serious tone throughout his picture. As a means to address the fact that his lead is indeed a horse, Spielberg employs John Williams’ score recklessly. The music swells at all the trite moments one would expect in a film of this sort, and serves to really underscore how inorganic and unnatural the film feels. And given that the film gallops at a bloated two and a half hour runtime, the feature can be a true assault on the ears. War Horse has the benefit of utilizing some incredible set pieces. The film’s final act has several scenes that mount the tension of the narrative well. It’s the sort of thing that Spielberg knows how to do well, as we have plenty of impressive war and chase sequences. But despite bits and pieces that I admired, War Horse never shakes this sense of falseness. The picture ascribes to an old-fashioned model of filmmaking that I’m not necessarily averse to, but in this case, it feels too manufactured and insincere for me to ever warm up to. Whereas Hugo marries a new technology to reinforce its fairy tale and Midnight in Paris adds a sharp wit to its nostalgic veneration, War Horse doesn’t pay tribute to films of ole’; it copies it with flat results. As we’ve entered the early November lull, awaiting the New York Film Critics Circle to announce their best films of the year, some of the mysteries of the season have been solved. Press screenings, early reviews, performance clarifications; it all has helped to address some of the looming question marks of the season. The lines are being drawn, campaigns are underway, and most of all; everyone is going to get a chance to see the films. A Badge of Honor. One of the more obvious pieces of news of the past few weeks has been the announcement that Shame will be rated NC-17. The film, which stars Carey Mulligan and Michael Fassbender, sees both actors going full-frontal. But unlike last year’s Blue Valentine, which also had received the NC-17 rating before appealing, there will be no intention of appealing the rating on behalf of studio Fox Searchlight. If anything, the studio intends on flaunting the film’s risqué subject matter, as studio co-head Steve Giulia notes that the film’s rating is to be worn as a “badge of honor, not a scarlet letter.” The buzz for the film’s rating is similar to that of Blue Valentine’s, in that it’s getting people interested in the film; but Blue Valentine’s Academy Awards play was strictly limited to Michelle Williams’ Best Actress performance; it’ll be interesting to see if Shame can expand its play and involve Michael Fassbender in an incredibly tight Best Actor race. 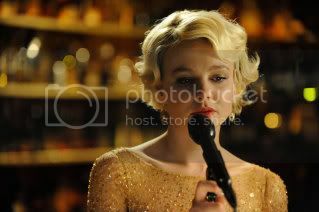 At this point, it’s looking like Carey Mulligan could become a serious player in the Best Supporting Actress category, as it’s far more fluid and open. Supporting “Carnage”. One of the lingering questions of the season was how the Carnage cast was going to be broken down into individual categories; that question has been answered in the form of tossing em’ all in supporting. The foursome, comprised of Jodie Foster, John C. Reilly, Christoph Waltz, and Kate Winslet are all going in the Supporting Actress/Actor category. In a move that draws parallels to how Modern Family goes about its awards season, Carnage all of a sudden looks far more viable than it ever had before. While Winslet and Foster have divided pundits as to who gave the better performance, Waltz has drawn considerable praise on the male side of things. And given the rather fluid state of the Best Supporting Actor category, he certainly seems like a strong contender. 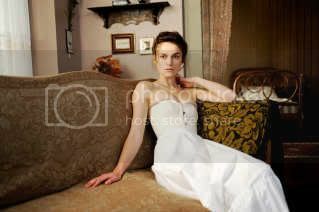 “A Dangerous Method” Upended. Well, it just doesn’t seem like it’s the year for David Cronenberg. One of cinema’s greatest working directors is not likely to have a single nomination going for his film, A Dangerous Method. The buzz for A Dangerous Method has diminished considerably in the past few months, and with a release just a few weeks away, there really hasn’t been much to keep it in the conversation. The last piece of news has seriously unfurled any sort of traction the film could have picked up, as Kiera Knightly is now going for Lead Actress category. Whereas she may have had a chance in Best Supporting Actress category, her chances have taken a significant hit as she is now in the same category as Glenn Close, Tilda Swinton, Felicity Jones, Elizabeth Olson, Michelle Yeoh, Michelle Williams and Rooney Mara; all of whom are battling it out for two spots (with slots reserved for Meryl Streep, Viola Davis, and Charlize Theron). I See (some of) You! Unlike previous years, this awards season is going to be largely decided last minute, as festival darlings haven’t made the dent we expected, and big films from big directors are held off until the end of the year. But the unfurling process for some of these late releases is certainly interesting. And for now, four big films have been seen by the press/pundits/general audiences. As Young Adult makes its way to various venues, the film’s buzz continues to grow. The screenings have solidified Charlize Theron’s Best Actress chances, and seem to have added fuel to the Patton Oswalt Supporting Actor train. Its Best Original Screenplay chances seem strong too. The film has found its nook within the awards conversation and seems to have nestled in quite nicely. As the film will likely have a good critical response, it could make a play if the stars align commercially. While Young Adult is making the rounds in larger cities, War Horse heads for smaller, rural venues. Undoubtedly a reflection of its ideals and demographical constituency, War Horse seems to be drawing very divisive reactions; reactions range from the film being a masterpiece to being blatant Oscar-reaching tripe. It serves to affirm my fears from its initial trailer: it’ll be a film of superficial values. An unfinished version of Martin Scorsese’s Hugo premiered at the New York Film Festival to generally positive reactions. I had initially pegged the film as a possible spoiler earlier in the season, and unfortunately, it doesn’t seem like it’ll be the case; expectations that the film will likely be a contender in the technical fields remain, but it’s not likely to make much of a splash in the above-the-line categories. Clint Eastwood’s J. Edgar premiered at the AFI Fest to a general consensus: it’s going to come down to Leonardo DiCaprio’s performance. The praise for the film tends to only involve DiCaprio, with Eastwood’s direction and Dustin Lance Black’s screenplay left to wolves to pick apart. Its Best Picture play will likely be minimal, though it remains a contender; as does Armie Hammer’s supporting performance. So, there’ll be five. And on the lighter side of things, the animated feature film shortlist has been announced, confirming that there will be five films up for the prize in the category. 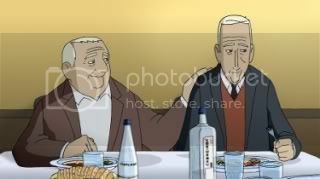 If anything, it gives Pixar a little breathing room to hope that Cars 2 will get nominated, though the contest will be largely between Rango and The Adventures of Tintin, with the obscure international film, Wrinkles playing as potential spoiler. Check out an updated Contenders page here. Also, expect a visual overall of each category page in the weeks to come; especially as the season begins to unfold. Part of what enamors me about the whole concept of Oscar prognostication is the mystery of it all. It’s trying to separate between your own taste and those of a larger voting body. It’s attempting to understand the perspective of studios in terms of pushing one actor over another. There’s nothing artistic about the process; if anything, it strips the artistry of filmmaking to a science. The science can become repetitive and mind-numbing; at my recent prescreening of Young Adult, director Jason Reitman expressed fatigue when dealing with the press and pundits. After the disappointing performance of Up in the Air following a long festival campaign to push the film, it’s no wonder he has opted to pursue smaller individual venues to get the word out. It works for me; Young Adult is one of the year’s best films, and the whole experience of having him, writer Diablo Cody, and actor Patton Oswalt to do Q&A was terrific. Just a year after Reitman’s Up in the Air fiasco, director David Fincher went all out on a press campaign for The Social Network. The film was critically lauded and looked to have had its Best Picture and Best Director wins sealed; that is until the Producers Guild of America awarded The King’s Speech instead. Things went south fast for The Social Network, so it’s no wonder Fincher has opted against any sort of awards campaign on his part for The Girl With The Dragon Tattoo. But as you can see on the updated sidebar, I’m thinking the film is going to play big. Like the Coens’ True Grit, I’m getting a sense that it’ll be the sort of late player that doesn’t have a wider buzz circulating around it until after its release. And perhaps this is a bold statement, but I’m thinking the film will be a larger commercial player than any of Spielberg’s films in the December timeframe. Part of what makes this whole prognosticating thing a snap is that I’m working with historical data. When you have someone like Meryl Streep, who’s been nominated 16 times since 1979, it’s going to be likely that she’ll be nominated again given the weight of her role in The Iron Lady. Sight unseen, you’re taking a logical bet. Similarly, Steven Spielberg’s one-two punch with War Horse and The Adventures of Tintin lead me to believe that he’ll secure a nomination (for the former, though it’s not out of the question for the latter) for either Best Picture and/or Best Director. Numbers are on your side. There are plenty of curveballs to throw you off though; there are typically one or two first-time nominees who enter the field. From there, you’re basing your information on others expectations, adding up praise and subtracting dismissals. One can attempt to create a formula to the whole affair, but then, there are those odd-ball nominations that simply come out of nowhere and can’t be justified (Tommy Lee Jones for In The Valley of Elah for one). But as we wait for the upcoming New York Film Critics Circle to outline what will certainly alleviate confusion as to who are “contenders” (which will be followed by the National Board of Review’s top films), it’s all guesswork. And well, it’s the best time for this sort of thing; it’s probably the closest any Oscar pundit gets to actually implementing their own cinematic taste into the proceedings. So for now, here’s my first stab at predicting the 2012 Academy Awards. It’ll be lots of fun to see how off I am come February 26. As I bought tickets for the Chicago International Film Festival today, I found myself prioritizing films based on their buzz, neglecting smaller pictures that may sound good but won’t be in the awards conversation for the year. It comes to a point where you have to embrace the hysteria around Oscar prognostication and take part in the conversation to the fullest extent possible. Fortunately for me, the Oscar conversation seems to be taking place outside of the festival realm. It gives me greater reign to actually look at films with little to no shot of entering the conversation due to lack of distribution or obscurity. But for films that have been garnering traction over the past few months at Toronto, Telluride, Cannes, and Venice, there’s a sense that it’s simply not enough. Whereas films like The King’s Speech or Slumdog Millionaire had an irresistible-force aura to their festival runs, no film really stands out over the festival circuit to lay claim to the prior two films’ crown. The Ides of March debuted at the Venice Film Festival and had its fair share of acclaim, but hardly the sort of fanatic diehard reception that a Best Picture nominee typically receives, let alone a potential winner. Steven McQueen’s Shame seems to be an actor’s showcase for Michael Fassbender and Carey Mulligan, but its appeal as a Best Picture contender is strictly contained to the art-house crowd. Madonna’s W.E. was a bust. Roman Polanski’s Carnage has failed to impress. What were left from the festival rubble are Alexander Payne’s The Descendants, Tomas Alfredson’s Tinker, Tailor, Soldier, Spy, and Michel Hazanaviccius’ The Artist. The three films are anchored by strong leading male performances, and while they are at this point, likely nominees, neither is on solid footing. The Artist debuted at the Cannes Film Festival and has garnered universal praise. The film will undoubtedly garner enough passion votes to secure a nomination come the big day, but I sense a backlash forming. This is largely in part due to where it stands in the minds of the voters – as new films enter the conversation by the week (Moneyball this week, 50/50 next, etc) there seems to be a decline in the film’s staying power with audiences. The fact that it did not win the Audience Award at Toronto (an award that was bestowed on Best Picture nominees and winners like The King’s Speech, Precious, and Slumdog Millionaire) does not bode well for The Artist’s standing. And given that the film may come across as gimmicky for its own sake, its positioning is nowhere near as secure as one is led to believe. But then again, The Weinsteins are behind the film, so I’m probably just imagining it all. The Descendants fits a specific pedigree of indie filmmaking that tend to get nominated once a year (Little Miss Sunshine, Juno, The Kids are All Right), but it has already been acknowledged as a lesser effort from those who saw it at Telluride. It’s still riding a wave, but I have reserved expectations on its potential once it gets a wider release. Its comedic roots aren’t going to do it any favors, nor will the fact that Payne has already been recognized (albeit, in the Adapted Screenplay category). There is typically a time when individuals get recognized for their efforts – this was the case with Jeff Bridges in Crazy Heart, Sandra Bullock in The Blind Side, the Coens for No Country for Old Men – it’s not meant to dismiss the accomplishments of the individual performance or direction, but rather it serves as a lifetime achievement award. Simply put, Alexander Payne’s time doesn’t seem to be just now. Tinker, Tailor, Soldier, Spy has the benefit of a British contingent to bolster its chances and has a good awards-story in Gary Oldman getting a role that will finally get him recognized with a nomination. It, for all intensive purposes, achieves a particular role of what to expect in a “Best Picture” nominee, and from there, I’d say it’s in better position than The Descendants The buzz for the film seems to have run stagnant for the past few weeks since its debut at Venice, which I take as a positive – I doubt Focus Features would to bust their load from the onset. Instead, there seems to be a conscious effort to keep Tinker, Tailor, Soldier, Spy in a quiet buzz period, before releasing it to a wider audience come December. Then we have the summer crop. The summer gave us some concrete possibilities of other nominees with Tate Taylor’s The Help, Woody Allen’s Midnight in Paris, and Terrence Malick’s The Tree of Life leading the charge. I’d wager all three movies have the potential to make it to the end of the race, as they all tend to rouse a sort of passion vote that is a requirement in meeting the 5% (of first-place votes) needed for a nomination in the category. This works particularly well for The Tree of Life, as its polarizing status won’t necessarily do it any harm come the end of the race – there are those who love it and hate it, and only those who love it will be acknowledged come nomination time. Amongst outside contenders, the only one that bares any possibility seems to be the final addition to the Harry Potter franchise – given its critical acclaim, there’s a sense that the film could sneak in for a nomination. I think not – unlike The Lord of the Rings franchise, none of the previous Potter incarnations have garnered above-the-line awards recognition. I sincerely doubt that will change. So we have six. This leaves us with the possibility of yet another four. Here’s where things get particularly tricky as we explore a great deal of unknowns. The general consensus has placed Steven Spielberg’s War Horse as the one to beat, and quite honestly, it’s not hard to see why. It’s a period piece, set against the backdrop of a war, with Spielberg at its helm. I talked about it being someone’s time earlier in this piece, and if anything, this season seems to be geared toward rewarding Spielberg yet again – his time seems to be here yet again. Remaining amongst the unknowns include Clint Eastwood’s J. Edgar. I’m hesitant to lobby for Eastwood’s place in the Academy’s circle, particularly given that he has been largely shut out of the larger awards for the past few years with Invictus, Changling, and Gran Torino. But then again, so has Woody Allen, and Midnight in Paris was a return to form, so it’s hard to make such blanket statements with no word on the actual quality of the film. Jason Reitman’s Young Adult is bypassing the festival circuit entirely, leaving one to question where the film stands at all. It’s written by Diablo Cody, which begs more questions than answers. Reitman’s previous two films have garnered directorial and Best Picture nominations, which lends itself to the same logic that has people believing that Stephen Daldry’s Extremely Loud and Incredibly Close is a lock for a nomination. My take: neither film will make much of an impact come nomination time, but if there’s one that might, I’d go with Reitman’s film. A big question mark that remains in the Oscar season and one that I sense could truly make a play that pundits are ignoring, is Martin Scorsese’s Hugo. The trailer displays incredible detail in the craft department, though there certainly seems to be a nostalgic essence to the film that could resonate with voters. Again, like with War Horse, J. Edgar, Young Adult, and Extremely Loud and Incredibly Close, we’re in a wait and see mode with these films, but the possibility definitely seems there. And that concludes my first column of what I hope will be a weekly column that looks at the Oscar race. In the meantime, the site will be going through periodic updates as I attempt to create a more interactive and in-depth Academy Award interface. The focus of the site will still remain on my reviewing of the films I see (with a new post coming soon) but hopefully I’ll be able to supplement that with my own obsessive thoughts on the Oscar race. © Daniel Nava, Chicago Cinema Circuit, 2011-2019. Unauthorized use and/or duplication of Written material without express and written permission from this blog’s author and/or owner is strictly prohibited.